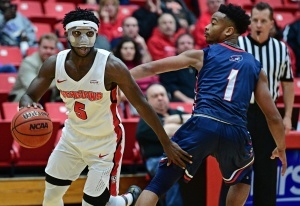 Five straight losses by the Youngstown State University Men’s Basketball team show signs of a team underperforming. Following a three-game skid in the Sanford Pentagon Showcase road trip, the Penguins dropped two more games since against Robert Morris and DePaul. Despite the Penguins having three players score in double figures in a close game, Robert Morris University was able to pull away late to win 81-74. The high scorers for YSU were Devin Haygood leading with 15 off the bench with Garrett Covington (12) and Braun Hartfield (12). The game was hard-fought throughout with eight ties and lead changes in the first half. Calhoun’s up-tempo offense was on display as the Penguins stayed pace to tie the game at 34-34 into the second half. The storyline of the second half was dominated by the Colonials’ Matty McConnell who scored 18 points and held YSU guard Cameron Morse to 1-of-9 shooting. The teams traded leads in the final minutes but YSU ultimately would fall late. YSU Senior guard Francisco Santiago went out with an injury late in the game. After that game, YSU traveled to play DePaul University. Traveling to Wintrust Arena, the Penguins dropped its fifth straight against DePaul, losing 89-73. The Blue Demons are a team that relies heavily on its starters with its starting lineup accounting for 80.5 percent of its offense. This is a contrast towards the philosophy the Penguins’ Calhoun preaches with his reliance on depth. For DePaul, its system seemed to be clicking with five players scoring in double figures and four starters adding to the total. Sophomore Braun Hartfield continues to be a bright spot for the struggling Penguins scoring 23 points, his third career 20-point game. He also contributed to a season-high 11 three-pointers for YSU adding five of his own. Calhoun gave him praise for his confidence level saying he could be a cornerstone for the team. eremiah Ferguson (5) drives past Jon Williams (1) to get to the basket on Nov. 29. It wasn’t enough to stop the hot shooting. DePaul shot 57.6 percent from the field to the Penguins 43.3 percent. Point guard woes continue. A lack of a point guard has plagued the Penguins with the Santiago injury furthering the hurt. “There are offensive deficiencies with having a point guard out you know those are things you have to overcome with your defense.” Calhoun said. As the saying goes, next man up. The next man for YSU looks to be Jeremiah Ferguson who looks to fill out the role of the facilitator on offense. Calhoun gave an update of Santiago’s injury status announcing his return is questionable. It was revealed Santiago has been playing through a torn ACL all season. Santiago ranks eighth in school history with 306 career assists, the ninth Youngstown State player to achieve 300 assists. Heading into this weekend the Penguins will continue a six-game road trip against the Butler University Bulldogs. YSU will face off against Butler this Saturday Dec. 9 with tipoff at noon.